The Omeka Workshop is being offered to support the activities of the UF Digital Humanities Working Group (DHWG) and others at UF. 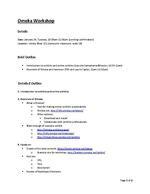 This is the outline for a 2 hour workshop on online exhibits and using Omeka for spring 2013 at the University of Florida. Omeka.net is a web publishing platform for publishing digital scholarship, presenting and contextualizing primary source materials, and presenting narratives around digital content.